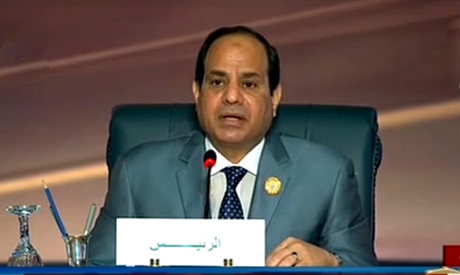 Egyptian President Abdel-Fattah El-Sisi announced at the closing session of the Arab League Summit in Sharm El-Sheikh that member states have agreed in principle to form a joint military force to deal with security threats. Membership in the force would be voluntary, according to the summit's final declaration. El-Sisi added that a "high-level" team will be created and led by Arab army generals to study means of forming this force. He also pledged to continue "working, communicating and coordinating" with Arab states on various common interests in the region. Arab League Secretary-General Nabil El-Araby opened the session by stressing an "absolute need" to confront all threats to the national security of Arab states. El-Araby called for unified "military, economic and societal" efforts in the face of these challenges. "What brings Arab states together is larger than what draws them apart," he added. He discussed threats and civil war conditions in Iraq, Syria, Libya and Yemen. Nabil El-Araby said Arab countries must coordinate their efforts and exchange intelligence information to combat the threat of terrorism in the region. El-Araby also rejected attempts to link extremist groups to Islam, and called on moderate religious institutions to modernise their religious discourse. He asserted that Yemen would be on the verge of destruction if the Saudi-led operation had not taken place. "We will continue to fight the Houthi rebels until they surrender and hand over their weapons," El-Araby said. He underscored the centrality of a just two-state solution to the Palestinian-Israeli conflict to the Arab League. El-Araby stressed the importance of preventing the proliferation of nuclear weapons in the Middle East, calling on Israel to sign the Treaty on the Non-Proliferation of Nuclear Weapons. He demanded that "Iran's nuclear programme must be subject to monitoring by the International Atomic Energy Agency." The summit listened to a statement of greetings from Russian president Vladimir Putin which was read aloud. "This summit is taking place amidst complicated political, economic and social changes in the Middle East and North Africa," the statement read. Russia values its ties of friendship and cooperation with the region, Putin said. He added that Moscow shares the Arab world's ambitions to have a better future, and the settlement of all conflicts through peaceful means, without outside intervention. Unfortunately the Arab world's security, according to the statement, faces dangers due to the activities of some terrorist groups that seize swathes of lands in some Arab countries and destroy their cultural heritage. Russia has great interest in solving the crisis in Syria, Libya, and Yemen through dialogue and national reconciliations, he said. Putin's statement also underscored Moscow's commitment to the establishment a Palestinian state, with East Jerusalem as its capital. Taking the microphone after Putin's statement was read, Saudi Arabia’s Foreign Minister Saud Al-Faisal strongly rebuked Russia's role in the Middle East, questioning its goals and intentions. He accused Moscow of contributing to the suffering of the Syrian people through its continued support to Bashar Al-Assad. Al-Faisal said: "Russia proposes a peaceful solution, but at the same time it is arming the Syrian regime of Bashar Al-Assad." maybe or maybe not Egypt need to get on the international stage and to rally the nation on a goes hunt but what strikes me more that Egypt need to develop the existing city and villages before building a new one unless the government need extra cash from sales of land and grocery . because they lake the management skill. so they control every aspect of life from deposit $ into the bank to chocking the country with duty, charges and taxation. as a german and history interested..
German historian, ha ha ha ..! A “German Historian” knows better not to give political and military advice to anyone. You’re an embarrassment to decent Germans! If Arabs left enjoyment life than sisi idea is successfull arabs must leave women and cars intrest than arabs become world Rulers .